When a film is abruptly removed from the schedule and placed on a waiting list for not one but TWO additional years, you know you’ve got an absolute stinker on your hands. 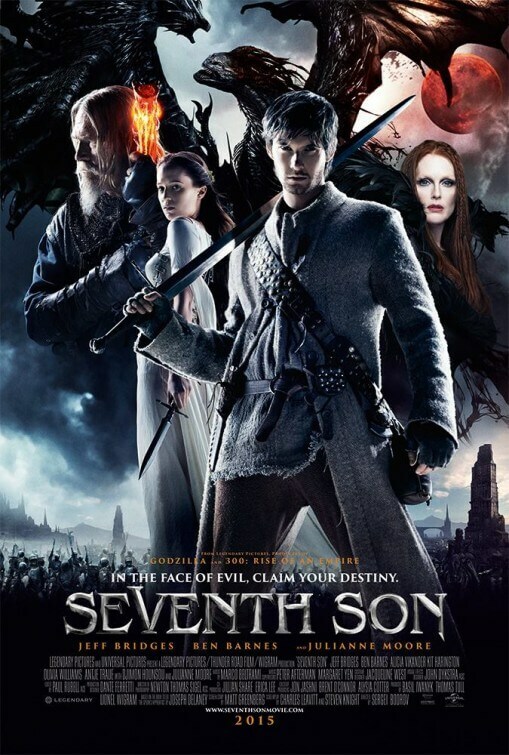 A victim of the messy divorce between distributors Warner Bros and Legendary Pictures – Universal has since stepped in to the former’s place – Seventh Son’s unfortunate scheduling woes aren’t helped by the fact that the overall quality is rather poor, substituting entertainment with an overabundance of genre clichés and a dull tone. You have to feel sorry for director Sergei Bodrov, twice nominated previously for the Best Foreign Language Film Oscar for Prisoner of the Mountains and Mongol, who with his first major studio outing here must have been handed note after note from studio executives, compromising his original vision to a point where it becomes unrecognisable, and making a sloppy studio picture as a result. Either that, or he simply didn’t care about the project to begin with; hardly any of the action scenes have real excitement embedded into them, and there’s a worrying lack of chemistry between his characters. However, the film does have an impressive production design with practical sets mercifully being used over something more CG-enhanced as is the norm for fantasy flicks nowadays. The problem is, Bodrov never seems to find much use for them other than places that the characters just happen to be conversing in. There is also a great misguidance in its casting department – on the one hand, it is actually a fantastic cast made up of Oscar-winning veterans like Jeff Bridges and Julianne Moore, and rising stars like Alicia Vikander and Kit Harrington; but on the other hand, most if not all of them are either completely wasted or left stranded with material that can only take them so far. For instance, why would you have Harrington, who at the time of filming was starting to become more popular thanks to Game of Thrones, be a prominent figure only to have him bugger off early into the movie? Same goes for other actors like Olivia Williams and Djimon Hounsou (the latter of whom seems to be typecast nowadays as a villainous lackey if not the main villain – see Guardians of the Galaxy and How To Train Your Dragon 2 for further details), who both come and go without even the luxury of making the most out of their trapped situations. Ben Barnes, as the young and plucky hero, is stuck with a character that is every other young and plucky hero Hollywood has to offer – Luke Skywalker, Will Turner, the list goes on – and seeing how his character makes some rather idiotic choices throughout the movie, it’s hard to fully get behind him. The only ones actually making the most out of everything are Bridges and Moore, and while these are not the kind of performances one wants to keep on their prolific CV they are at least having some amount of fun chewing the scenery and camping it up to extreme levels. The choice of accents is odd, too; for some reason, most people in this movie seem to speak with an American twang, even the British actors like Harrington, Barnes and Williams when it would have probably made more sense to have them use their native accents. However, much of the film’s unintentional hilarity comes from trying to decipher what the hell kind of accent Bridges is trying to pull off, let alone what he’s actually saying – he makes his Rooster Cogburn from True Grit sound coherent in comparison. It’s clear that Bodrov doesn’t quite have the grasp of handling bigger budgets than he’s used to, with said production design and cast mostly going to waste, and bringing in uninspired make-up work and ropey visual effects with an ugly, over-digitalised look that desperately imitates Peter Jackson’s Hobbit trilogy. You can blame the likely studio interference all you want, but there’s no denying that Bodrov’s inexperience really shows in the final product regardless. Even the script, co-written by Blood Diamond’s Charles Leavitt and Locke’s Steven Knight of all people, feels lacking and re-moulded by endless studio-approved ghost writers, containing all the clichés and tropes done more effectively in other films before it. It all adds up to a film that’s just completely dull without a hint of its own identity within the rubble. 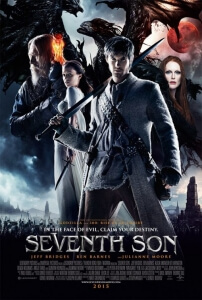 It’s a shame because there is definitely some good talent both in front of and behind the camera, but for whatever reason none of it is put to good use in Seventh Son, a clear and unfortunate victim of studio systems and unwise scheduling decisions. Seventh Son is a messy and dull fantasy flick that squanders much of its talent both on-screen and off-screen, with director Sergei Bodrov’s inexperience with high-budget studio films showing heavily in the final product and actors like Oscar-winners Jeff Bridges and Julianne Moore left mumbling their way to an easy pay-check.